12-hour Kirtan! ~ The Toronto Hare Krishna Temple! Chanting, drumming and dancing! 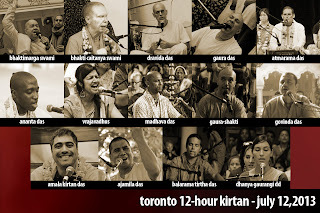 Festival of India is thrilled to announce that we will, once again, be holding a 12 Hour Kirtan Festival on July 12, 2013! We will be spiritually tearing the roof off with a 12-hour kirtan marathon, starting at 10:00AM until 10:00PM. A spiritual explosion will be created with kirtaneers from around the world, including: HH Bhaktimarga Swami, Madhava prabhu, Amala Kirtan das, Ajamil das, Bali and Dhanya from the Mayapuris and MANY MORE! Here is the kirtan schedule! Please invite your friends and family and join us for this spiritual marathon! That's because this is the website posting from 2013. ;-) We will be putting up a post for the 2015 12-Hour Kirtan soon! Hare Krsna!